One effective method of reducing turnover and helping retain top performers is creating a culture they can’t imagine leaving. Employee recognition programs play an important role in that effort and a key component of an effective program is recognition from peers. Meetings and events are the perfect venue to accomplish this goal and foster a community-like celebration. 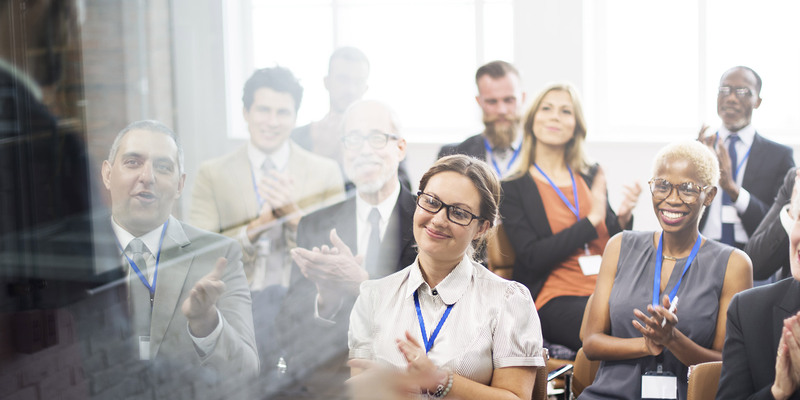 No matter the scale, a small regional meeting of 100 or large national meeting with 2,000+ attendees, events are an opportunity to recognize top performers while they are among their peers. And more importantly, it allows for a shared, in-person celebration of the accomplishment. Research has shown that peers are the top driver of satisfaction in the workplace. Additionally, for those in attendance who weren’t recognized, seeing the celebration could spark the inspiration they need to achieve more. Meetings and events can help reinforce cultural attitudes, but it takes consistency to build it. Employees want to know their efforts matter to the organization, that what they’re doing makes a difference. A survey from Globoforce shows that 73% of employees who have been recognized consistently over a period of 6 months felt engaged at work. Moreover, employee recognition helps them feel appreciated, which in turn helps them feel good about themselves and the job they’re doing. No matter how formalized your recognition program is, if leadership fails to consistently activate it, it won’t do any good. Employees don’t leave good companies or employers, they leave managers. Management must make it a habit to seek out and reward excellence. By regularly engaging in employee recognition efforts, management also demonstrates the importance of the program. As competition for top talent increases, many organizations find it increasingly difficult to compete on salary alone. A culture of recognition based on a well-executed employee recognition program can help your organization stand-out. It may also act as the difference-maker for a recruit. Competition for top talent will only continue to increase, and what you offer in terms of compensation will always play an important role in attracting top talent. More and more, however, it’s the non-tangible things such as company culture that will figure prominently in setting your organization apart from the rest. A true employee recognition plan goes far beyond simply thanking your employees for a job well done. Management needs to tell employees specifically which efforts they demonstrated that upheld the company’s values, and how that behavior leads to achievement the company’s key objectives. It offers employees context into what value their efforts play in the big picture. Everyone wants to see meaning in their work, and often time, are just in need of a reminder. Meetings and events are an excellent forum to provide these reminders, and to celebrate achievement as a group.